Sometimes, recruiting freelancers just feels like organized chaos. When I post a public job on the Upwork marketplace, there are usually hundreds of applicants within minutes. Last month, I posted a project seeking experienced web developers. I was very excited to see the new freelancer recruiting funnel that has been launched by Upwork Global Inc. (“Upwork”). In this post, I’ll share a few thoughts on this nifty new feature. When you hear the word “funnel” in a business context, it most often refers to sales and marketing. 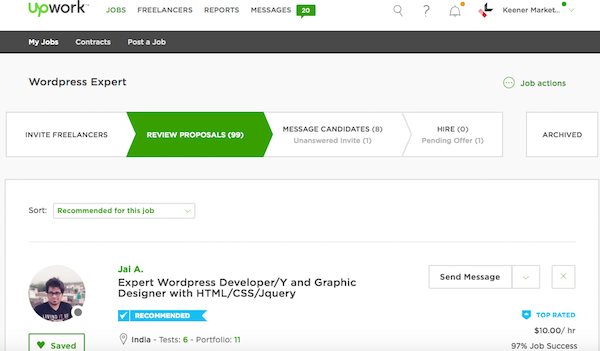 Upwork has taken the same concept and applied it to the freelancer recruitment process. This is extremely valuable, especially when you’re a busy person like me. Honestly, I can’t remember what I ate for breakfast yesterday. It’s therefore difficult to remember which candidates I have already chatted with or invited to interview. In addition, this new visualization makes it easier to de-clutter your life. Unsolicited applicants appear in the “Review proposals” tab, while invited applications appear in the “Message candidates” section. As I’ve discussed in previous posts, my preference is to first use advanced Upwork filters and invite applicants. If none of my invitees work, then I’ll start reviewing unsolicited proposals. I also appreciate how each pipeline phase is clickable and sortable. Within a few seconds, I can toggle between the various stages. And, thanks to the Upwork success score, identifying top-tier candidates is much more streamlined. Personally, I look for candidates with a success score of 90% or greater and at least 100 hours billed. As conversations progress, clients can now “Save” freelancer profiles for future reference. Upon clicking “Save,” you are prompted to enter notes about the candidate. This feature is especially helpful when you’re interviewing multiple candidates over several days. If you’re tired of sifting through hundreds of applicants’ profiles, it’s time you gave the new Upwork recruiting funnel a try. I intend to use it heavily in the coming months and years, and I’m sure my clients will as well. It’s a simple, yet effective feature (in my humble opinion). What do you think about this new feature? Is it a game-changer for you? Please post comments below, and I’ll respond back to you.